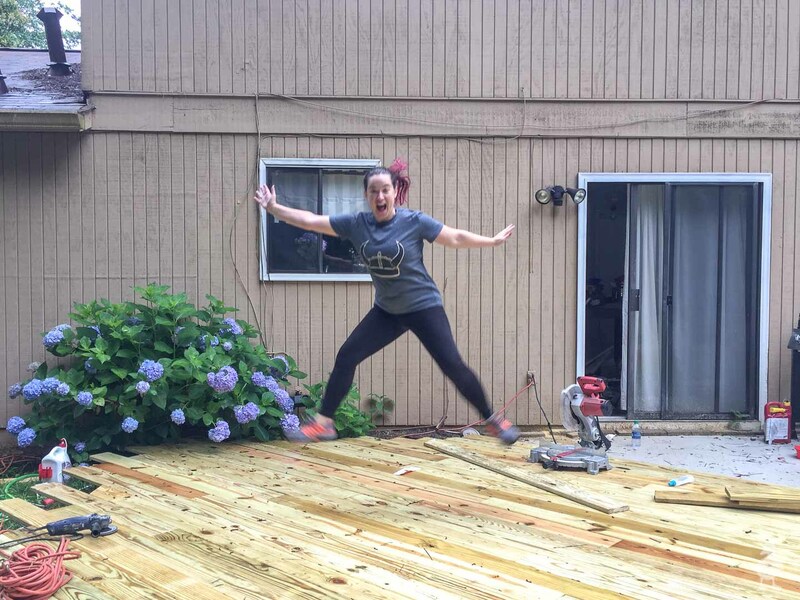 I’m building a DIY floating deck in my back yard! Catch the whole thing, start to finish, right here. 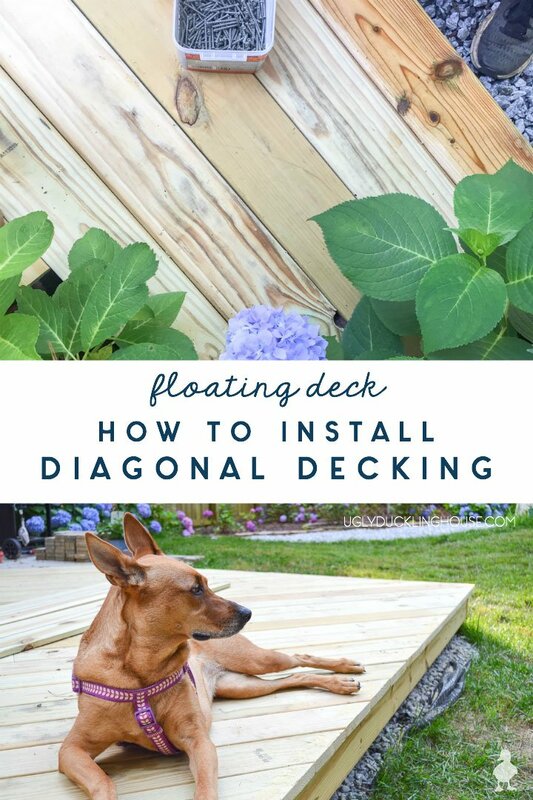 In this chapter, I’m covering the details on decking on a 45-degree angle. Hey hey! I know some of you have been waiting since last month’s post for the next update on my ground-level deck, and here it is! 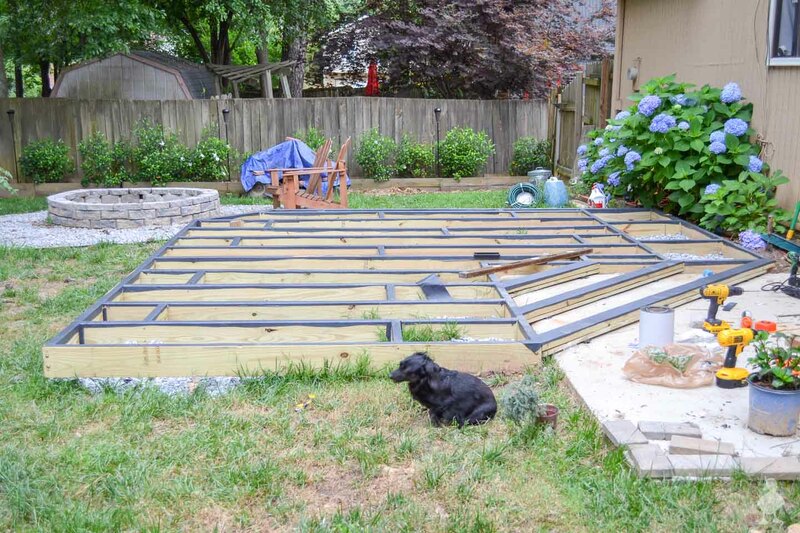 The last time I posted about the deck, it was a full recap on all of the things required to ensure a solid foundation, water resistance, type of wood to buy for the frame, etc. Since there has been way too much info to cover everything in a single post, I’ve been dividing it all into separate parts. 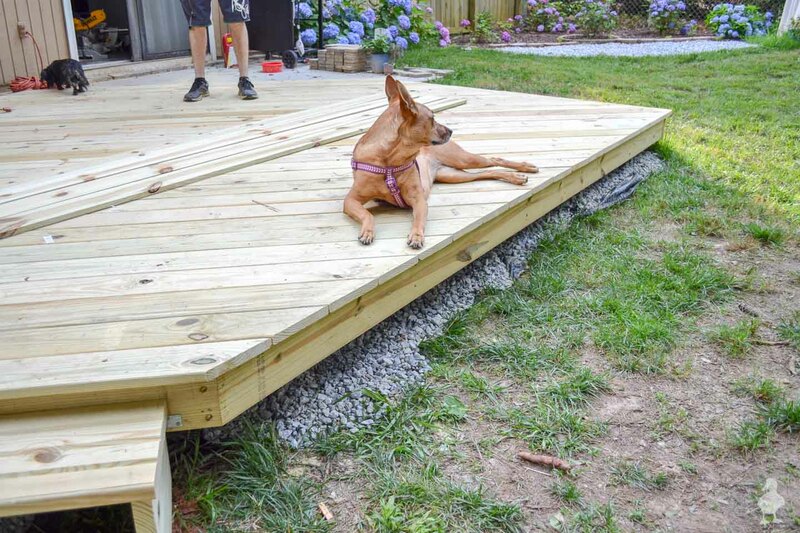 And now, it’s onto the the next step: decking on a 45-degree angle. This was one of the most exciting completion steps for me, since this is when you start to see the deck really come together. This deck project is sponsored by Wood Its Real. Getting the 45-degree angle was easier than I thought it was going to be. I think the main reason for that is because the angle was spot-on from the frame underneath. To make sure I kept my alignment correct, every now and then, I’d extend a board with a square edge perpendicular to the 45-degree angle I was laying the boards to. As long as the bit hanging off of the other end was even and not crooked, I was good to go. I planned for a 1-inch overhang on all sides, but it really only mattered when fastening the first deck board on. After that, I just kept the ends jagged and hanging off; I would later trim all of the other sides down to continue the 1-inch overhang. It worked almost like a clamp, expanding itself over the edges of each deck board. When clamped down on the board, its metal tabs provided a consistent 1/16″ gap between each board. I think this is plenty, since I did most of my install between rain storms (this has been the wettest summer!). As the deck boards have since had time to dry out, they have a little bit larger of a gap now. I think if I had gone with something wider initially, it would look too gapped by now. Once clamped onto the deck, it had a screw guide on each end to guide one of the specialty screws at an exact angle so as to fasten the deck right at the edge of the board. This makes the whole deck pretty much look fastener-free. It doesn’t work for the very ends when you have a little bit of an overhang, but I don’t mind having just a few screws visible. I bought the CAMO materials as separate items, but sometimes it’s sold as a whole kit as well. 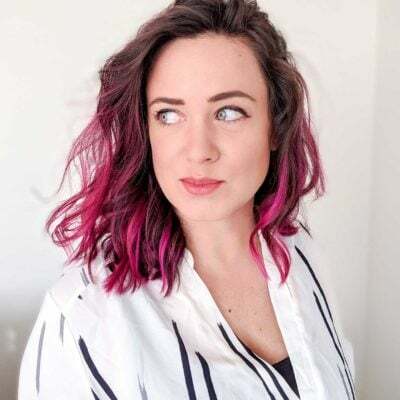 Note that they work as a system together, so you’ll need to invest in buying the screws that match up to the tool if you go the same route as I did. 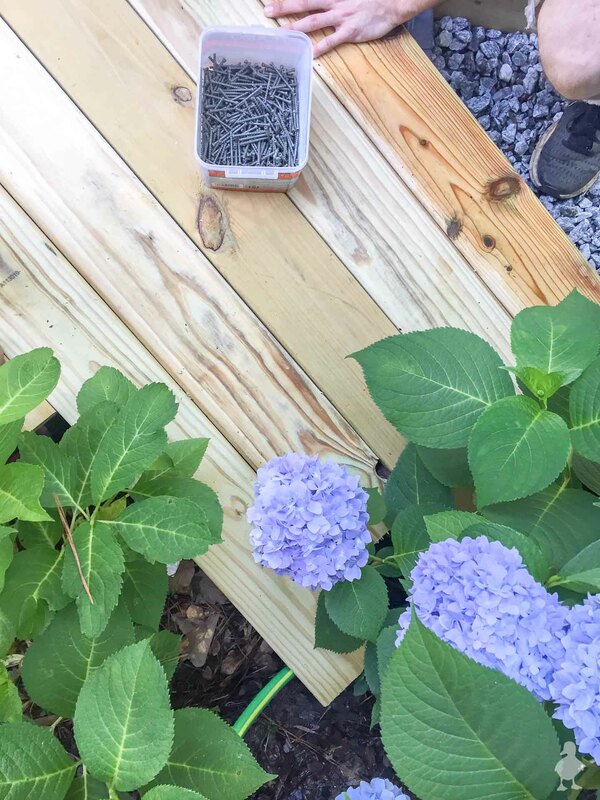 I had enough screws to last me through my deck, the pub shed deck, and the pub shed bar… so they go a long way! No regrets! Since the CAMO screw box comes with two bits to use with the screws, I found using multiple drills and impact drivers at the same time sped things up a good bit. K and I could both work on the same board at once and just pass the guide tool in between. 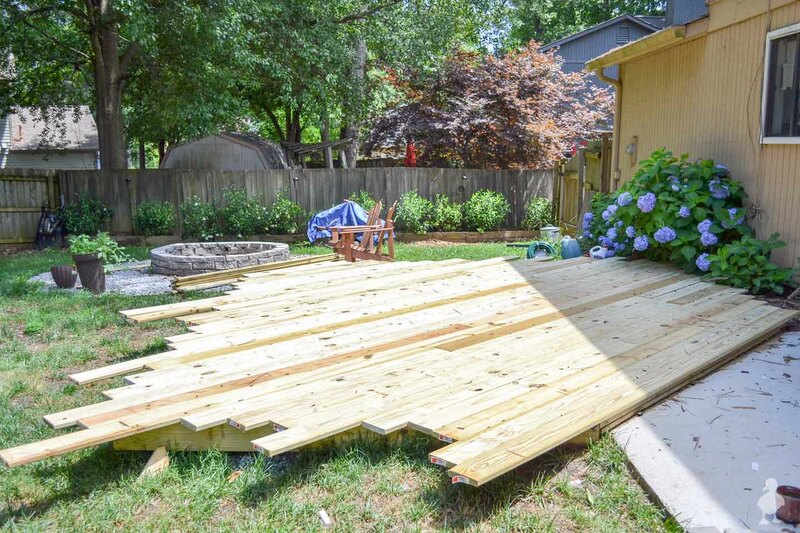 When I started with the first board, I realized that I didn’t have enough support where the deck went over the patio. It was easily fixed with a few scrap pieces added in, but the rest of the deck’s framework needed no modifications. The boards I bought were only 12 feet long. The store might also sell 16′, but even that wasn’t going to be long enough to extend over the longest parts of the deck. That meant I would have to lay two boards side by side in multiple places along the deck. It’s probably no surprise that I have notes for you on that, too! Work in a Z pattern: When one board wasn’t long enough to span a single row, I used a full board, then cut off another piece to fit the remainder. On the next row, I again used a full board, but started from the other end (where the shorter piece from the previous row was). I would usually then be able to use another cut piece for the rest of the row, and so on. Doing this Z pattern of swapping which end to start with a full piece resulted in fewer seams meeting up across rows, so they weren’t as noticeable. 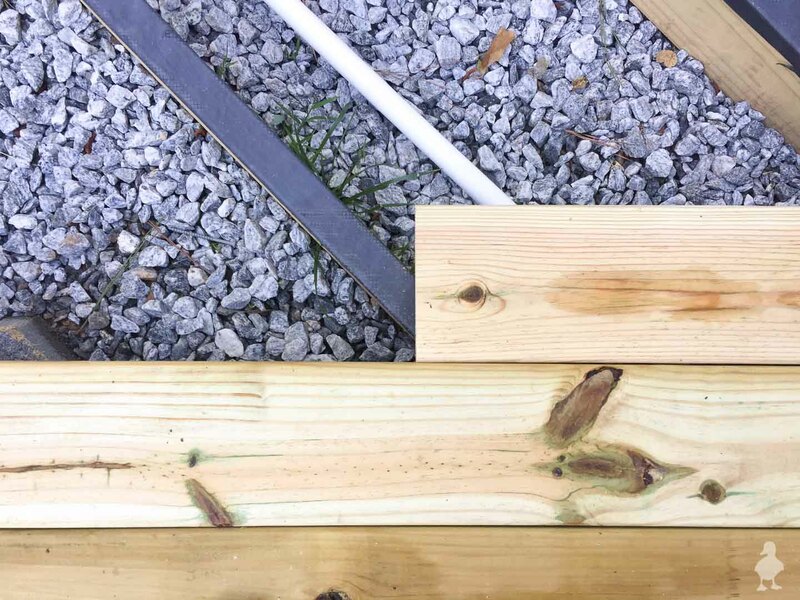 Square up the seam: I found that the edge of most of the deck boards to be slightly off square. Using my miter saw, I squared them up and was able to lay them side by side with almost no perceptible gap. Just be sure to lay the board so that both ends, when laid side by side, are well-supported at this seam. Add another support if not, or move the seam to . Test before screwing them in that you can step on top without any wiggle (that seam will only get weaker over time if so). Pressure treated wood is often wet when purchased, and the rain continued to wet down my boards as I installed. So, it was inevitable that some of the meticulously-checked straight boards I bought warped a little once they were home and drying out. I was able to fight a lot of it by regularly flipping boards on a flat surface so that they could dry evenly, but I still wound up with a few that twisted on the ends and such. For this, clamps were my best friend. I would also sometimes position the boards so that the warped part got cut off once the deck was trimmed down to its actual shape. Something I know I could have made the job easier on myself, but didn’t: trimming back plants! 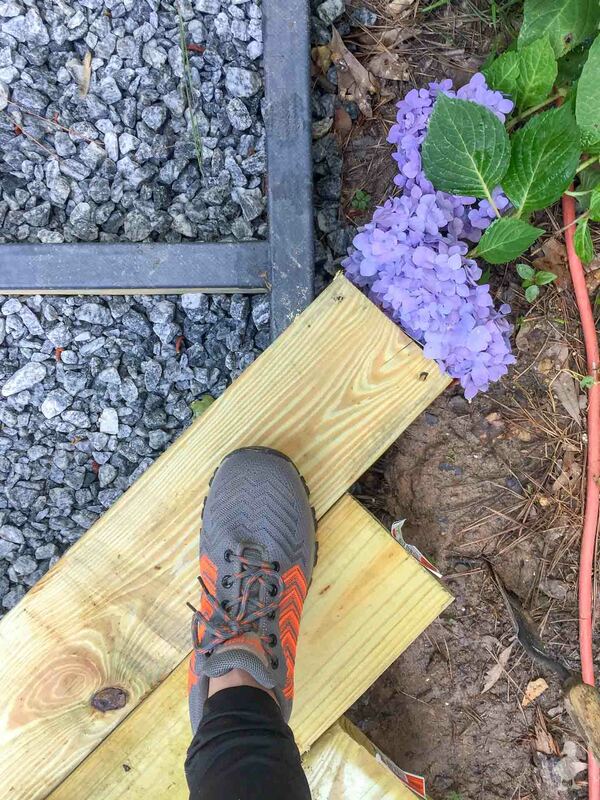 Installation happened right as my hydrangeas were blooming like crazy, and I hated the idea of chopping them down to make it easier to access one of the corners of the deck. I eventually did, but if you watch the video, you’ll see one funny part where I’m basically installing with a faceful of blooms. Ok, so not exactly totally finished when the decking is in place. 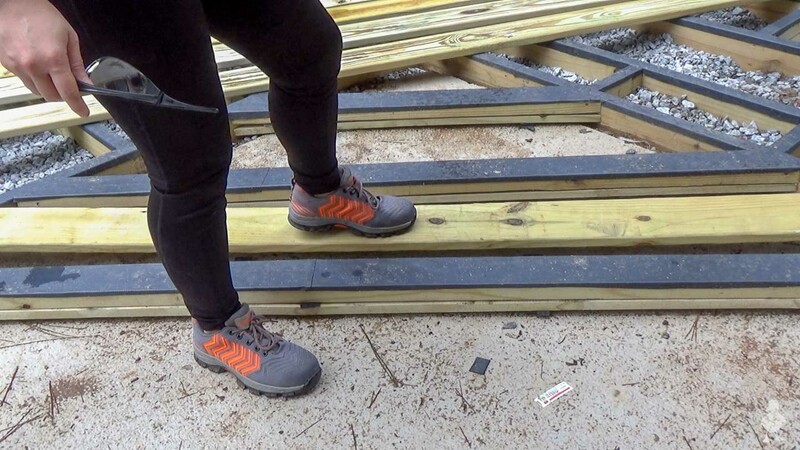 In the next part of the deck series, I’ll have to walk you through how to trim the boards to a straight line and round off the end. Then we’ll install some steps, improve the landscaping, stain, and more. But this was a huge step! More soon. What a great project!! I love the deck! Great job! Your links all seem to go to the main Target website. I don’t think that’s your intent as they don’t seem like the place to buy a specialty decking tool. Might want to check things over. Arg, darn link redirects. I’ll correct that asap, thanks so much for the head’s up! Looks great! I love darker stains like mahagony & black cherry! Poor little pup! She doesn’t like the grass tickling her tush! Thanks! I am thinking of going black with the deck furniture, so maybe something lighter on the deck itself, like a Golden Brown that’s a little darker than the house color?? I would love gray but it would clash with the house color too much (and the roof color is on the reddish side too, ugh). Love black deck furniture – looks cleaner longer :) I see your point about tying it into to house & roof. Hmmm …. mixture of Walnut and Golden Oak? Stains are my only frame of reference. I’ll be picking up samples tonight and sharing on IG stories (@uglyducklingDIY) but it’s going to be similar. I’m going with opaque stain so that it lasts longer on the wood.